All New With Tags. 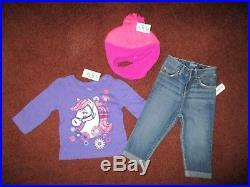 Toddler Girls Fall & Winter Clothing Lot. 10 Complete Outfits and more when you mix/match. You will receive 10 top, 10 bottoms and 2 hats. 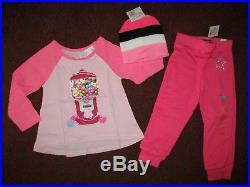 Most of the clothing is size 2T. A few are 24 months. Old Navy Boyfriend blue denim jeans. 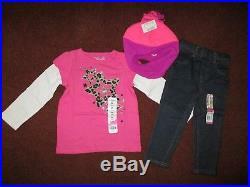 The Children’s Place pink sweat pants. Garanimals purple sweat pants. Old Navy blue cherry print leggings. Old Navy red floral print leggings. Garanimals navy blue denim look jeggings. Garanimals pink yoga pants. Garanimals black yoga pants. 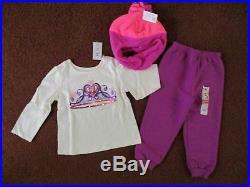 Jumping Beans pink sweatpants. 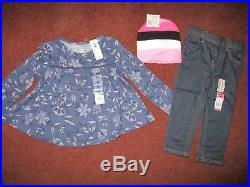 Old Navy blue floral print baby doll top. The Children’s Place beige with purple tiara and sequins top. Jumping Beans pink top with leopard print star print. Okie Dokie black with owl print top. 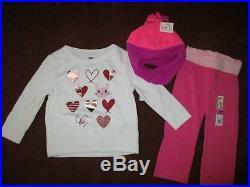 Old Navy white with bunny and heart print sweat shirt. Garanimals gray with multi-colored floral print sweat shirt. The Children’s Place pink gumball machine print top. 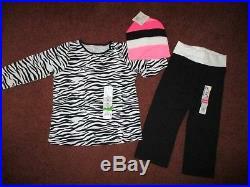 Jumping Beans black and white zebra print top. 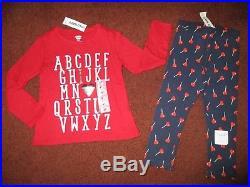 Old Navy red ABC print top. The Children’s Place purple horse print top. 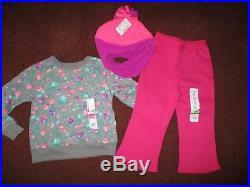 The Children’s Place pik and purple fleece hat. Healthtex pink, black and white stripe knit hat. 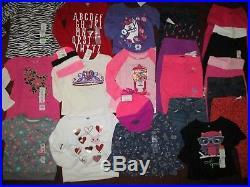 The item “NEW NWT’S Girls FALL & WINTER Size 2T Lot Clothes & Outfits Wardrobe” is in sale since Saturday, September 1, 2018. 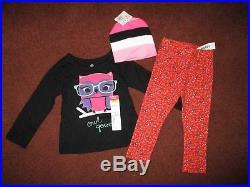 This item is in the category “Clothing, Shoes & Accessories\Baby & Toddler Clothing\Girls’ Clothing (Newborn-5T)\Mixed Items & Lots”. The seller is “cherry1928″ and is located in Lompoc, California. This item can be shipped to United States, Canada, United Kingdom, Denmark, Romania, Slovakia, Bulgaria, Czech republic, Finland, Hungary, Latvia, Lithuania, Malta, Estonia, Australia, Greece, Portugal, Cyprus, Slovenia, Japan, Sweden, Taiwan, Thailand, Belgium, France, Hong Kong, Ireland, Netherlands, Poland, Spain, Italy, Germany, Austria, New Zealand, Philippines, Singapore, Switzerland, Norway, Saudi arabia, Ukraine, United arab emirates, Qatar, Kuwait, Bahrain, Croatia, Malaysia, Brazil, Chile, Colombia, Costa rica, Dominican republic, Panama, Trinidad and tobago, Guatemala, El salvador, Honduras, Jamaica, Antigua and barbuda, Aruba, Belize, Dominica, Grenada, Saint kitts and nevis, Saint lucia, Montserrat, Turks and caicos islands, Barbados, Bangladesh, Bermuda, Brunei darussalam, Bolivia, Ecuador, Egypt, French guiana, Guernsey, Gibraltar, Guadeloupe, Iceland, Jersey, Jordan, Cambodia, Cayman islands, Liechtenstein, Sri lanka, Luxembourg, Monaco, Macao, Martinique, Maldives, Nicaragua, Oman, Peru, Pakistan, Paraguay, Reunion.